These early days of the Osprey breeding season are alway so interesting, and behaviors change as populations grow. When you take the time to really watch, and read bands to identify individual birds, so much is revealed. Yesterday I went to visit a nest that I discovered over the winter and I found a banded female on the nest who I had seen at another nest, with another male, last Wednesday! I have documented a lot of movement between nests and extra pair copulation over the years of studying these birds. So today I need to return to the first nest where I saw this female to see who is there now! To fully understand and document what is happening requires me to return to re read bands, reevaluate what is occurring, sometimes over and over as things are still in flux! I also visited our single Dad again to see what was happening with his potential new mate. I found her perched near the nest, eating a goldfish. She is a beautiful osprey and she is still there which is a good sign. The male arrived with a stick and worked on the nest, then he flew over to try to copulate with her, but she said, NO. She stood up very straight and did not lift her tail, flapped her wings, and off he went. It maybe that she is unsure here, or she may be too young to breed. She is unbanded so I don’t know her age. I watched this male, who I have known for so many years, thru so many different nesting sites, so many different mates. There is a kind of knowledge and understanding of the nuances, combined with knowing so much about the histories of the individual banded birds that makes each year of studying these birds more and more fascinating. We are watching the annual game of musical nests as it unfolds....when a great horned owl takes over a nest so that pair of Ospreys moves to their neighbors nest! What happens? We watch as some of our old friends do not return and a single Osprey may hedge its bets by taking up with a new potential mate, while still also waiting for its former mate to return. I hear people tell me all the time, “our Ospreys have returned” when, in fact, it may not be the same birds! To me it is often very evident by the defensive behaviors the males display. Today I recieved several different reports of nests where more than two Ospreys were peacefully hanging out together! Many ask if these are the offspring of the original pair. I doubt it. We used to band approximately 85% of all chicks and in my 25 years of watching these birds, I have documented a banded osprey returning to its natal nest only once. (And ironically, it’s our single Dad!) So what is happening? Clearly, the expansion of the population creates a great deal of competition for nest sites, but when there is no aggression shown, I suspect the birds are sending some signals that they are not a threat. Ospreys are semi colonial, so Ospreys attract other Ospreys. They seek out other birds as a way of learning if this is a good area to live....is it free from predators? Is there a good source of food? I have seen this several times in recent years, and eventually the territorial birds usually say, OK move along now! There is still a lot to learn and I am still curious! Every year I understand a little more about them, and every year, more questions are raised that keep me captivated! As I was out and about today, I visited the nest of our single Dad. Yesterday I found no one there. Today, at first, the nest was empty but then I saw an Osprey gliding towards the nest, but he kept going, circled around, went up high and started a sky dance! Then I saw her, the other osprey, for whom he was dancing....she landed on a favorite perch of his former mate. He danced for her for quite a while, they flew around together....but it doesn’t appear as if it is a done deal. I told her that he is a great mate, and she would be hard pressed to do any better. I had to leave for an appointment, but am hopeful. He is trying to get a girl! I also found several more Ospreys incubating. Have gotten a lot of lovely bits of info from the public.....people I don’t know, just sharing photos, observations, return dates of their favorite Ospreys, etc....it’s heart warming to know the public is watching, and is aware of my efforts, a lovely network is being created! What a lovely day.....I visited 15 nests and still had many more I had hoped to get to, but didn’t. Sigh. Sometimes bands can take a long time to read, especially on such a bright sunny day. I did visit the arboretum cam nest and both Ospreys are back on the nest.....Z3 was there with an unbanded female, just loafing. It was interesting how many nests had a lone female, waiting.... presumably because the males are having to travel further to get fish with so many lakes still frozen. But some birds were eating so they are finding food! I saw one male struggling with an enormous fish, looked like a pike! Lots of copulating, sky dancing, extra birds chasing.....clearly there is a great deal of competition for nest sites. Some new birds have shown up on nests, which may mean we have lost some of our old friends. But some nests are still empty so we still have Ospreys that have not made their way back to Minnesota. Things are still in flux! Thanks for all the reports, emails from the nest monitors as well as the general public! I appreciate each tidbit of info that is shared! I always enjoy the conversations about behaviors, bird histories, research goals and each chance to share my passion for these birds. Finally a warm day and some free time to check nests. I visited 13 nests and 7 of them had at least one bird, 6 nests were still empty. I saw 12 Ospreys and read two bands. At two different nests I observed three Ospreys flying, and interacting. None were aggressive. At one nest I watched TWO males sky dancing at the same time for a female that was standing on the nest, seemingly unimpressed. One male landed without a fish and he turned his back, hung his head, and shook his wings. This is a defensive behavior. I often see it with a new pair of Ospreys, but I suspected this was her long time mate as he had a band, tho I was not able to read it in the short time he was on the nest. The female eventually lunged at him, and he flew off. The other male was sky dancing with a fish and he finally delivered it to her. He was unbanded. She took the fish to a nearby perch to eat as the male moved sticks on the nest. He tried to copulate with the fema,e but she said, NO! Then the banded male returned, without a fish. I watched for nearly two hours as the behaviors were interesting, unsettled, and I am always captivated by the way these birds interact, they way they renew old bonds, the way new birds try to find a way to win a territory and a female. 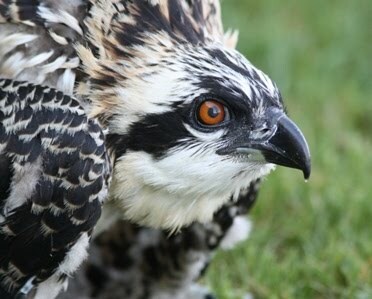 So our Osprey season is picking up the pace, new birds finally arriving on these warm southerly winds. I wish I had more time to spend in the field...there are so many nests to check, new volunteers to meet, and bands to read. Thanks to the monitors who are visiting so many nests and band reading as possible. We have our work cut out for us! It was nice to be out there, listening to the courtship songs, watching these beautiful birds and remembering why we love them so much! I know that some of you were waiting to hear about this fellow....and I had concerns since the last time I saw an osprey near this nest last September, it was being chased by a pair of bald eagles. Big sigh of relief!!!!! Now we are hoping that he will find a wonderful female to build a family with...any female would be lucky to mate with a male that was such a devoted parent. And a great provider! Woo hoo! WOO HOO......I have seen my first Ospreys and read my first band! It’s an old friend! Female unbanded so I will have to get out my drawings and see if it’s the same female. Copulating, bringing sticks....so I do hearby officially declare that the 2018 Osprey breeding season has begun! Now where they are gonna get fish is another story! We are getting reports from around the metro and I have read three bands already...so we are off and running! So we have gotten a few reports of Ospreys, tho our monitors have not been able to confirm identities yet. But the south winds may be the start of our osprey season.... before winter comes this weekend again! So start your cars nest monitors.....I will check some nests tomorrow! I know you are all waiting, waiting, waiting for some Ospreys to show up, some news about our beloved birds. Many Ospreys are back on their nests in Montana, New Jersey the UK....and here in Minnesota? Nope. I have heard one reliable report of an osprey sighting, but repeated visits to that area have found no Ospreys, no fresh whitewash on the nests. With most lakes still frozen, I suspect our Ospreys are having quite a party somewhere south of here.....Missouri? This is one of the latest osprey seasons in my memory, and I suspect it will mean that when the weather turns and lakes begin to open up, we will have a LOT of Ospreys returning all at once! And their little biological clocks will urge them to lay eggs quickly! So for those of us monitoring these nests, our best time for band reading will be short, intense. Oh boy. Thanks to all the volunteer monitors who have been busy checking empty nests.